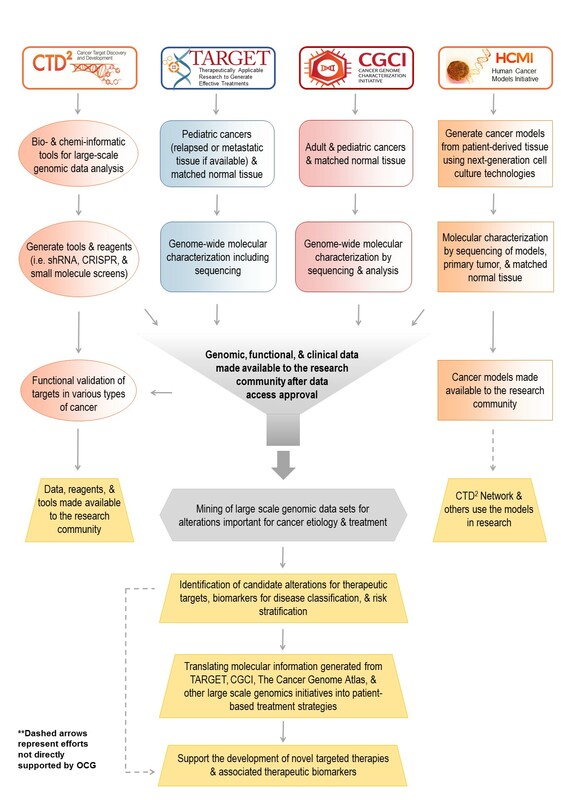 The Office of Cancer Genomics (OCG), within the Center for Cancer Genomics of the National Cancer Institute (NCI), supports high-throughput genomics, the development of the next generation human tumor-derived culture models, and systems biology approaches to advance the knowledge of mechanisms involved in the initiation and progression of cancer. OCG initiatives aim to accelerate the translation of research findings to improve the clinical outcomes of cancer patients. Figure: This flowchart visualizes the interactions between the four OCG-supported programs to achieve the aforementioned goals. View or download a 508 compliant version.